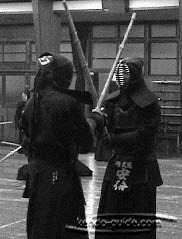 Tsubazeriai (tsuba-zeriai) is probably only a situation where two kendoists get really close to each other in kendo. It looks like a clinch you see in boxing. So many people think that it is a resting position or a good opportunity to think what they are going to do next. Tsuba-zeriai is not for any of them. Let me explain what tsuba and zeriai mean. Tsuba is a hand guard. Zeriai is actually "seriai", which means competition. I would like to use "fight" instead of competition here. Seriai becomes zeriai because of some linguistic reason that I don't know. Sorry. So tsuba-zeriai means "hand guard fight". 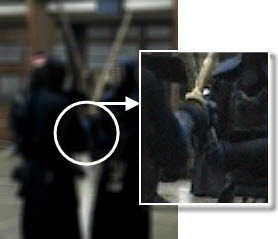 If you watch a samurai movie, they do that when they get close to each other after their strike. And they try to push their opponent back in order to create another chance for them to attack. So tsuba-zeriai is not a resting position or relaxing position. You do not want to stay in tsuba-zeriai for a long time. So if we happen to have tsuba-zeriai, we have to make sure that the tsuba of our shinai and that of our opponent are touching. In other words, it is not our hands and our opponent's hands that are touching. Tsuba-zeriai should be done with the tsuba not with the hands; otherwise, it is not called "tsuba-zeriai". Of course, our hands and the opponent's hands touch in a process of tsuba-zeriai. And also probably we would not want to stay in this position if we used a real sword. I would not feel comfortable with the blade right in front of my face. In Japan, people who do not do kendo also use the term, tsuba-zeriai. It means "competing (fighting) with each other fiercely" since their skills are similar. Close competition is maybe the English word for "Tsuba-zeriai". I do not hear the term very often anymore in a daily conversation since it is kind of an old word. But it is good to know that Japanese have terms from samurai swordsmanship.